Downstream contamination in Chaudiere River / lab results show 200 - 1,400 PPM of Polycyclic Aromatic Hydrocarbons that accumulated into Open-Celled OPFLEX mobile eelgrass matrix in 24 hour period. Templar Titan offers plan for clean up of Lac-Megantic, Quebec oil train disaster. Smith continued, “The disaster in Lac-Megantic, Quebec is the most recent in a disturbing trend of oil spills that began in March of this year with the ExxonMobil Pegasus pipeline break, along with other recent spills in Western Canada. Opflex Solutions, Inc. announced today that it received the fingerprinting results from OPFLEX® Technology deployed and demonstrated downstream in the Chaudiere River from the Lac-Megantic oil train disaster on July 10th and 11th, 2013. The Open-Celled Elastomeric structure of OPFLEX Technology allows it to attract, adsorb, and remove all types of oil including diluted bitumen “tar sands” while repelling water. First introduced during the 2010 Deepwater Horizon oil spill in the Gulf of Mexico, OPFLEX Technology was used, approved, and endorsed by BP America. Over 2 million square feet of OPFLEX was used by BP to remove crude oil from the coastal wetlands and near the site of rig explosion. BP re-used OPFLEX products an average of 25 times, effectively using 50 million square feet. OPFLEX not only adsorbed more oil than the typical white sorbents, but as an Open-Celled elastomeric foam sponge, OPFLEX can be squeezed or centrifuged to remove and recover the oil quickly and prevent damage to sensitive ecosystems. BP’s deployment of OPFLEX Technology was reported in a November 15, 2010 USA Today cover story: http://usatoday30.usatoday.com/money/industries/environment/2010-11-15-gulfcleanup15_CV_N.htm. OPFLEX was the only new technology deployed that removed oil, recovered oil, was re-cycled, and re-deployed by BP out of the 43,000 ideas submitted. Recently, Mr. Smith began collaborating with the Woods Hole Oceanographic Institution and its scientists in the development and commercialization of Open-Celled Synthetic Eelgrass. 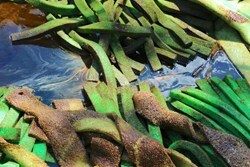 The mobile version of eelgrass was recently deployed downstream from the Lac-Megantic, Quebec oil train disaster.